Why Is This Happening To Jason Garrison? After being called up, then sent down, then called up again, then sent down again, Jason Garrison has once again been called up to the NHL and will likely be in the lineup tonight in Calgary. To the novice, it seems like George McPhee just can’t seem to figure out what he wants to do with Garisson, but in reality, he’s actually doing the smartest thing possible to make sure he has a sixth defenseman on the NHL roster for as long as possible while Merrill, Sbisa, and McNabb are all hurt; while also not taking the risk of losing Garrison on waivers. In the NHL, if you want to send a player to the AHL he must clear waivers unless he’s waiver exempt, which 33-year-old Garrison is not. When the Golden Knights originally sent Garrison down to Chicago on October 28th, he had to pass through waivers. In short, that means any team could have taken Garrison and his contract without giving Vegas anything in return (see Malcolm Subban & Ryan Carpenter). Presumably, he was not claimed in October because of his $4.6 million cap hit. Thus, by clearing waivers, Garrison remained property of the Golden Knights, and was eligible to play in the AHL for the Chicago Wolves. So what does that mean? It means the Golden Knights can freely send Garrison to and from Vegas to Chicago without him having to clear waivers until he plays 10 NHL games or more than 30 days have passed while he is on the NHL roster. The Golden Knights have made a pair of roster moves prior to this afternoon’s game against the Colorado Avalanche. Defenseman Jason Garrison, who has been a healthy scratch for each of the last four games, was placed on waivers and will be reassigned to the AHL if he clears waivers. Griffin Reinhart has been sent to the AHL on a “conditioning stint.” Basically, it’s a rule in the CBA which allows players who are consistently healthy scratches to be sent to the AHL to play in games. The stint can last for a maximum of 14 days and the player remains on the NHL active roster throughout the entire stint. Therefore, the moves open up one roster spot for the Golden Knights. That will be used to bring Erik Haula off the IR after his knee injury sustained against the Detroit Red Wings on October 13th. Teams will have 24 hours to place a claim on Jason Garrison. If one does, Garrison (and his $4.6M cap hit) will become a member of that team. 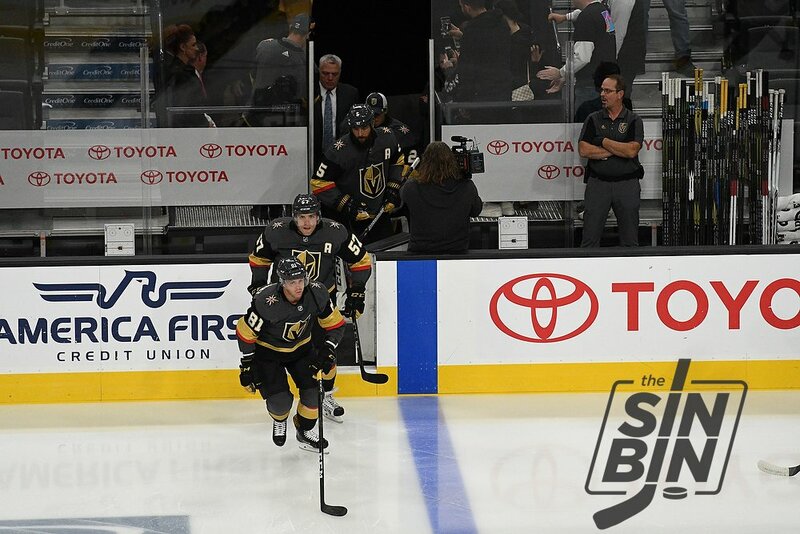 I know it’s unique, but then again everything about the NHL in Las Vegas is unique. The Golden Knights announced yesterday, that they’ll be going with a leadership core of six players. Normally, a team will award one Captain and two Alternate Captains. Vegas will have three home Alternate Captains and three different road Alternate Captains. The six leaders are; Deryk Engelland, Jason Garrison, James Neal, David Perron, Luca Sbisa, and Reilly Smith. Would it be Deryk Engelland, James Neal, Jason Garrison, Pierre-Edouard Bellemare, or even someone else we haven’t really considered having the famous “C” stitched on to their first Golden Knights jersey? Well, it looks like the correct answer, at least to start the season, will be none of the above. As we discussed on the latest podcast, there’s really not a single player that stands out as the guy who would make sense to be the captain of the Golden Knights. Marc-Andre Fleury would make the most sense but in the NHL, goalies cannot be designated captain. Next up would likely be Engelland, but he’s on the back-nine of his career and may struggle to even get on the ice consistently this year. Then there’s Neal, who has been an assistant in the past, but could be a trade candidate at the deadline in February. So McPhee, Gallant, and Co may go down the three alternate captains road. It’s not unprecedented in the NHL. Last year neither the Hurricanes nor the Leafs named a captain, and there have been many vacant captaincies across the league over the past decade. There’s also the Minnesota Wild, who famously (or infamously) rotated captains each month for the first few years the franchise was in existence. Wouldn’t expect VGK to try that plan. Instead, expect the Golden Knights to name multiple assistants as a part of their “leadership group.” There’s only one name almost guaranteed to be among that group, and that’s Engelland. The rest are about as fluid as those last defenseman spots. McPhee said this is part of a press conference today at City National Arena. Here’s the whole presser.